To celebrate our 90th talk, on our eighth birthday, we were delighted to welcome back Laurie Maguire, Professor of English Literature at Magdalen College, Oxford, a leading authority on the life and works of William Shakespeare - and who has been in great demand this year on the 400th anniversary of the playwright's death..
Laurie told us on October 14th that, nearing the end of this anniversary year, she wanted to think about memory and commemoration - and so had called her talk Remembering Shakespeare. In some respects, she added, memory is very straightforward for us - we know how to remember and pay tribute, as witnessed in commemorative stamps and coins featuring Shakespeare - and we curate exhibitions and re-edit the plays, such as in the New Oxford Shakespeare. We also celebrate with a string of TV and radio programmes, mainly biographical programmes about that tired old chestnut - was Shakespeare Shakespeare? As one Guardian reviewer commented: "It's a mark of celebrity when people commemorate your birthday by debating whether you ever existed”. We give anniversary lectures and we even quote Shakespeare at Prime Minister's Question Time - and so it's clear we know how to remember in 2016, she said. However, Laurie added that she was most interested in the question - how did Elizabethans remember? What did memory and commemoration mean in 1600? And the Shakespeare play that poses that question is Hamlet, a work that is haunted by memory, quite literally - and written at the turn of the century, in 1600-01. Hamlet, she said, is a play that begins with memory in its strongest form, an inability to forget, as Hamlet sees his father in his mind’s eye and dwells obsessively on his mother’s re-marriage. Laurie added that the play ends with memory in its political form, territorial expansion - the Norwegian Fortinbras claims some "rights of memory" in Denmark. In the middle, the play invokes memory in a theatrical form when the touring actors showing up at Elsinore are asked, unexpectedly, to recall a speech that Hamlet hopes "lives in their memory". It also has memory in a romantic form (Ophelia’s "remembrances"’ from Hamlet) and memory in a physical form - the tablebooks in which Hamlet writes that one may "smile and smile and be a villain". Laurie pointed out the ghost gives his son one very specific request – "remember me" - but this isn't as straightforward a request as it seems. In 1600, in a post-Reformation climate, she asked, how do Protestants remember when the Reformation has swept away Catholic memorial rituals – requiem masses, wakes, chantries, anniversary prayers? The question arises for Hamlet audiences because the Ghost comes from a recognisably Catholic purgatory - he describes his torments confined in fire until "the foul crimes done in my days of nature are burnt and purged away" But his son, Hamlet, is a student at that icon of Protestantism - Wittenberg, Martin Luther's University. Laurie claimed the question dominating her teenage school years - is the play Catholic or Protestant? – misses the point and suggested that it's both - a Catholic ghost returns to his Protestant son. This isn't just a literary scenario but an Elizabethan reality - because in 1600 everyone had a Catholic grandparent and many people had Catholic parents, whilst living in a country that was officially Protestant. That raises all kinds of complicated questions about mourning and remembrance. Shakespeare’s grandparents died before he was born and Shakespeare’s father died in September 1601. Laurie said we don’t know about Shakespeare’s confessional allegiance but there's some evidence that his father was a Catholic, at least on his deathbed. These Catholic grandparents, as well as aunts and uncles, have to be buried, mourned and remembered. But, she asked, how? It's not entirely coincidental that the comedy written alongside Hamlet is Twelfth Night, a play in which Olivia is mourning her dead brother. And she mourns his loss in a specifically Catholic way – she has a chantry, The play is of excess - excessive grief, excessive love - but the point is that Shakespeare did not need to specify the chantry. So Laurie suggested Shakespeare is very interested in rituals for remembrance of the dead - and he would have been fascinated with everything that's been done this year. Laurie then moved on the question of memory from the religious sphere to the literary sphere, and asked - how do writers remember the dead and how are dead writers remembered? Writers, she said, remember the dead through writing elegies, that traditional genre of lament for the dead. For instance, in 1603, there was a huge outpouring of poetic grief for Elizabeth's death and the market was flooded with elegiac poetry (although none was written by Shakespeare - a fact commented upon at the time). In 1612, the sudden and unexpected death of Prince Henry, James’s son, plunged England into shock and many volumes of poetry were printed. One of them was a collection of poems by three playwrights: Cyril Tourneur, John Webster and Thomas Heywood, with the title-page in beautiful funeral black. Commemorative poems are not confined to royalty, she added. 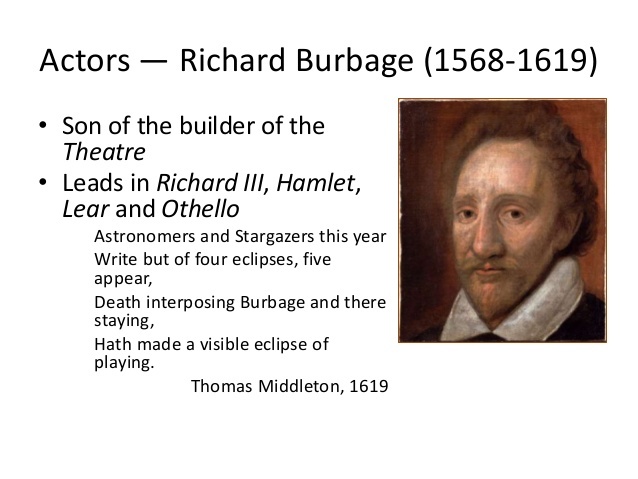 The death of Shakespeare’s lead actor, Richard Burbage (the first Romeo, Richard III, Hamlet and, Lear) in 1619, had a similar impact. One poem says the person who could best perform grief is dead - and the outpouring was so lavish that it threatened to overshadow official mourning for Queen Anne, who had died a few days before. The question of how are dead writers remembered is more complicated, she added. Why are some dead writers remembered? Why do some writers stand the test of time and others don't? Obviously, she added, it's too simplistic to say: "because some writers are geniuses and others aren’t". Laurie suggested that we remember some writers because others remembered them. And for that process of remembrance to be successful, it has to start early in a writer’s posthumous literary existence. This, Laurie told us, is where John Heminge and Henry Condell come in – actors with Shakespeare in the Chamberlain’s Men (later the King’s Men) investors in the Globe, and editors of the First Folio -- the posthumous volume collecting Shakespeare's works. Shakespeare remembered these men as his friends in his will of 1616 - and we remember Heminge and Condell because they remembered Shakespeare, collecting 36 of his plays "only to keep the memory of so worthy a friend and fellow alive, as was our Shakespeare". That quotation comes from Heminge and Condell’s prefatory epistle to the First Folio, addressed "to the great variety of readers". It’s an advertising ploy and it's explicit in its claim to completeness. Whereas before readers were exposed to inferior copies, Heminge and Condell tell us, now they have "cured and perfect of their limbs and all the rest – [ie the rest of the works] – absolute in their numbers, as he conceived them". Laurie suggested that in the images – maimed, deformed, limbs that are now perfect. and Heminge and Condell are putting Shakespeare back together. They not only remember Shakespeare, they literally re-member him. They give us a body – a body of works, a corpus. The volume is both a memorial to Shakespeare and a relic of him. Books become memorials, added Laurie. At this period, collected editions of living authors were the exception. More typical are the posthumously published works of writers like John Skelton, George Gascoigne and Edmund Spenser. John Donne’s poems were first published in 1633, two years after his death. The title page stresses the author’s death and the memorial nature of the volume - in fact, it's more concerned to point out to us that the author is dead than it is to tell us who the author was. 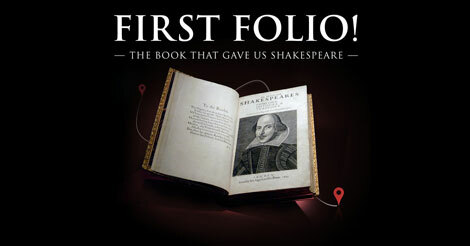 But these poetic tributes are less important for Shakespeare’s memory than the plays that follow in the Folio. When Shakespeare died in 1616, fewer than half his plays were in print and they were only in ephemeral quarto editions, the equivalent of our modern paperback. Heminge and Condell added 18 more plays to the Shakespeare canon - without Heminge and Condell , Laurie pointed,we would not have The Tempest, Macbeth, Antony and Cleopatra, Twelfth Night, As You Like It, Taming of the Shrew, Much Ado about Nothing….all plays that are crucial to our sense of Shakespeare. Laurie suggested that we remember Shakespeare because Heminge and Condell remembered him.. All writers need someone to curate their memory, to give them a lasting memorial, to turn them into a book. Shakespeare’s younger contemporary, Thomas Middleton, was not so lucky - although he was as big a box office attraction as Shakespeare in his own day, and he wrote more plays than Shakespeare. It was in 2007 before anyone collected his works and, as a result, we don’t have a Royal Middleton Company. Laurie said that writers need someone to curate their memory, as well as luck - and Shakespeare was lucky that he had Heminge and Condell. But he was lucky in other ways, she added. He did not write topical, satirical or didactic plays - these are genres with a short shelf-life and didactic works die as soon as their moral imperative expires. Likewise topical works and satires rely on knowledge of current events and current personalities for their impact, and future audiences cannot be trusted to recall the details of the dusty past. Shakespeare generally masks his topicality with imaginary or historically distant settings – ancient Rome or London - connecting it to broader, perennial human problems such as the right use of power. 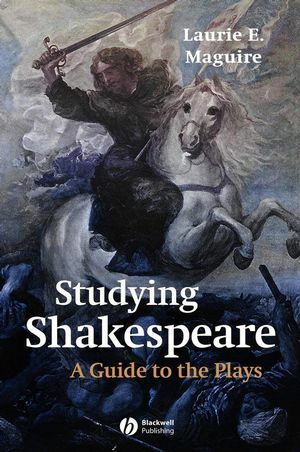 Laurie added that he was also interested in human character - and this is robustly transhistorical and transcultural - social conventions change, politics change, the position of women changes – but at the heart of every Shakespeare play is a human character trying to make a go of a situation. Twelfth Night, she said, isn't about being shipwrecked in Illyria - it's about being obsessively in love; Hamlet isn't about a character murdering his brother to get his throne - its about bereavement, a university student who can’t get over his father’s death. Romeo and Juliet is about the pressures family and society place on young people and the tragic conclusion – teen suicide – is not an issue that is confined to the sixteenth century. 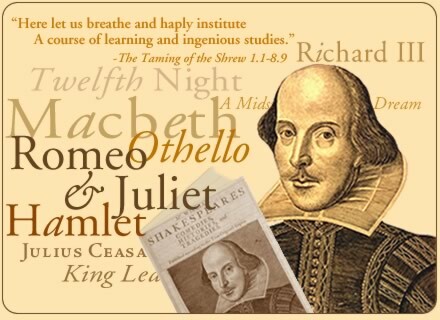 Shakespeare was lucky in that he wrote in a variety of genres - comedy, tragedy and history, she added. If you look at the table of contents of the Folio, you can see that his canon is actually pretty equally divided among these three genres. Writers who work in many genres have a better chance of being remembered – different types of plays can come in and out of the canon as fashions change and guarantee longevity. 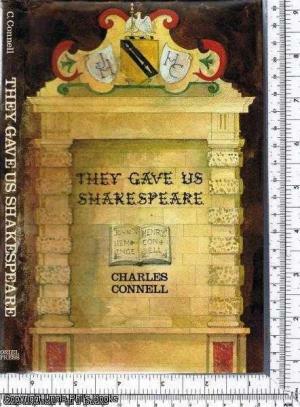 Laurie added she thought Heminge and Condell were aware of this - the volume isn't called Shakespeare’s Works (like Ben Jonson’s Folio) or even Shakespeare’s Plays but Mr William Shakespeare’s Comedies Histories and Tragedies. Heminge and Condell are promoting what we now call the USP – their author’s Unique Selling Point.